26 years later, Calvin passes the tiger to his daughter, Bacon. Sorry if it disappoints you guys, but thereâ€™s not gonna be any more Hobbes & Baconâ€¦ not for a while, anyway â€“ our comic is more of a skit show, we do a gag, sometimes two, and then we move on, just like Family Guy or Robot Chicken, if we kept going, then it would be a strip about Calvin & Hobbes, and thatâ€™s just not what we do. We tried to stay true to what Calvin & Hobbes meant to us, and what the style and atmosphere was, and I hope that we were able to capture what people loved about the strip â€“ which is impossible, weâ€™re not Watterson, weâ€™re the Heyermans â€“ thereâ€™s no way we can totally capture his style, no matter how much we tried. But the most important thing, what we really wanted people to do was to go back and read Calvin & Hobbes, or support Watterson by getting the books if you donâ€™t have them. We donâ€™t make any money on the strip, so hopefully you take all your desire to read more Calvin & Hobbes and support one of the most amazing artists of our time. Some of us were lucky enough to be around when it was happening, to read Calvin & Hobbes in the paper, and if youâ€™re like us, it guided and shaped who you are, and drove you to be different and be creative. Itâ€™s no exaggeration to say that Pants are Overrated would be a completely different thing if Bill Watterson hadnâ€™t created his masterpieces every day when we were kids. This really makes me think of the comic so much. When I went out for a walk, I could’nt stop thinking about it. The style and work is really beautiful. I loved the nostalgic feeling. People don’t think of comics as art but this definitely proves them wrong. This is a good skit even if it is only a skit. Please just do at least one more and then you can stop. I understand if you don’t want to but please just one more. Thanks for this and everything else. No matter how much I want to see more and no matter how much I hate to admit it you’re wright and it was wrong of me to expect other wise. You’re not Waterson and you should stick with your own thing. 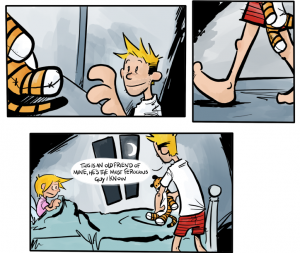 But I love seeing people do Calvin and Hobbes stuff. It helps me know that they live on in the hearts of others and it’s always good to see how many people are influenced by them.